"I'm corporal Jones. I don't know how long it'll take to get back to being Johnny Jones, private citizen. " During World War II, a few in show business directly enlisted in the military, such as Jimmy Stewart. By and large, however, both the studios and the government recognized that entertainment during wartime was essential to keep up morale at home. This entertaining documentary covers how showbiz did its part during the war. Hosted by comedian David Steinberg, the program consists almost entirely of film clips of stars in various roles. Loosely broken into subject matter areas, such as propaganda films, bond sales activities, the Command Performance radio programs and USO shows for the troops, the program gives a decent overview of wartime activities of Hollywood. With quite a few musical performances culled from radio programs and movie musicals, there's always something interesting on screen here. The gung-ho can-do attitude of these pieces is quite infectious and irresistible. The use of cartoons for ethnic putdowns of the enemy on a propaganda basis is dealt with forthrightly and without apology. Disney's Victory through Air Power is glimpsed briefly, making one long to see the full film. We also see Disney's Seven Dwarves, brought into service to defend against malaria and Donald Duck pay his taxes in support of the war effort. One has to wonder about the choice of smarmy comic David Steinberg to act as host; perhaps Roger Mudd was busy that week. Though he does a decent job, one expects Steinberg to go into his shtick at any moment. The program does give a very good capsulized background of the events leading up to the war and America's involvement in it. The film clips are chosen to good effect, though Abbott & Costello's overly familiar Who's on First routine could have been replaced with something different and perhaps more topical. Image Transfer Review: While the framing pieces with Steinberg look sharp and attractive, with excellent color, the film clips are not in the best of shape. Most of the film clips are excessively dupey and soft in appearance. Those which were in Technicolor are mostly faded to yellow throughout (excepting the Disney pieces). The black and white segments are lacking in black levels and tend to be overly contrasty, though the segment from Jack Benny's To Be or Not To Be looks great. The video bit rate runs about 5 Mbps. The titles are an exceedingly unattractive video-generated red. Audio Transfer Review: The 2.0 mono audio is generally satisfactory. The narration is clear and undistorted, but the period clips tend to suffer from noise, hiss and distortion, which is only to be expected. It's quite clear that no efforts were made to clean these materials up, either on the video or image front. Extras Review: Nothing at all, other than inadequate chaptering. Not even subtitles. 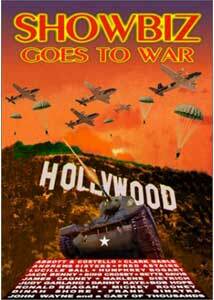 An interesting and thoroughly star-packed view of Hollywood during World War II, with plenty of musical numbers and film clips. Unfortunately the visual quality of the clips is lacking and there are no extras to speak of. Worth a rental.